1.8 GHz VIA C7 processor with fan. 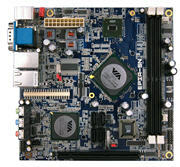 VIA's first Mini-ITX mainboard designed around the new CN896 chipset with VIA Chrome9 HC Integrated Graphics and full Windows 7 support. Versatile platform providing a new range of possibilities for the embedded market.